In 2001, death and destruction fell from the sky upon Manhattan's World Trade Center, leaving behind thousands lives slaughtered, a gigantic scar in the City, human beings forever broken by the loss of their loved ones, and a universal trauma. 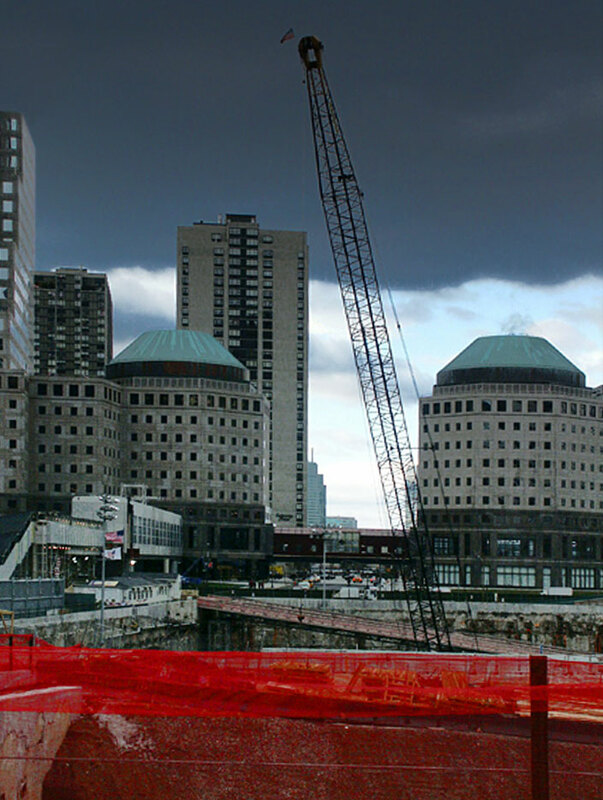 By summer 2002, six proposals for a Rebuilding of the WTC Site were unveiled ; none of them proposed a reconstruction of the Twin Towers. They were therefore rejected by a vast majority in the community of the New Yorkers. 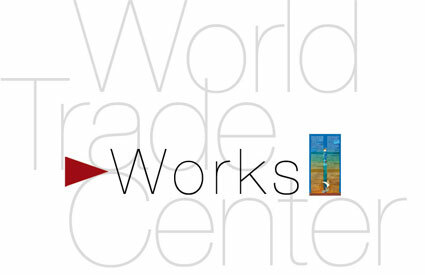 Yet the Lower Manhattan Development Council Program's anthem was the Rebuilding of the World Trade Center. One could thus expect to see at least some projects showing the Twin Towers back. 1- Remembrance and homage to thousands Lives destroyed and to thousands pf People mourning and grieving. 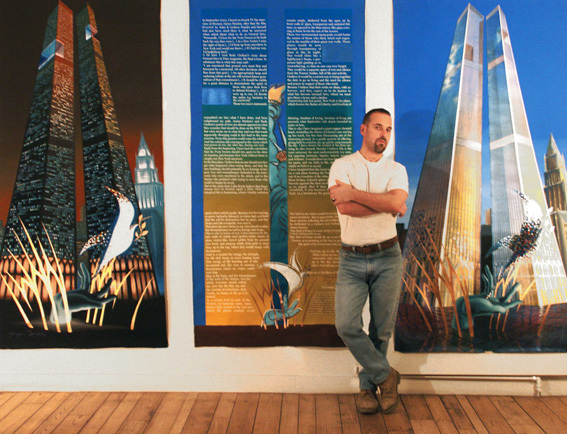 2- Restoration of the worldwide famous Manhattan's Skyline. Of course, the problem with that equation was that attempting to solve one of its terms seemed to automatically inflict injury to the other. Making one side happy seemed to result in dooming the other to frustration. Once the Twins' rebuilding rationally became an obvious assumption, then difficulties began, because one came right up into the equation's first term : remembrance and homage to thousands Lives destroyed and to thousands of People mourning and grieving. Because one had to admit that rebuilding the Twins just as they were meant in a certain way restoring the Skyline as if nothing ever happened. At that point it became obvious to me that if the Manhattan's Skyline demanded a rebuilding of the Twins, it was mandatory that the new buildings could testify for the future and give evidence about what had happened on September 11th, 2001. Then this idea that had invaded my mind for a long, long time, and which I had kept asleep, started to wake up. This idea did justice to the ones who lost their lives. Because the memorial to their suffering would be inscribed in the flesh of the buildings, at their very core, and could not be ignored. This idea took into account the victims' relatives. It offered a vast and majestuous space of silence for meditation and contemplation, symbolically placed at the exact spot where the victims were trapped and murdered in the most atrocious conditions, annihilated in the blast of the aircrafts and for those who had survived them, burnt alive in the fires, dying in suffocation and despair, prefering defenestration to the pyres of kerosene, the survivors perishing ultimately in the collapse of the Towers. This idea took into account the restoration of the Skyline of Manhattan. Because it restored its silhouette, but at the same time paid a visible homage to the 9/11 tragedy, visible from afar, during day and at night. So far, I just had a concept on my mind. I knew then that I had the means to make it real, with my painting. I started implementing three paintings. The first one was to express the concept, the whys and therefores of the thinking process. This one I called the "Manifesto" painting. The two others were to show the reality of the concept, what it looked like by day, and at night. Starting early September, I spent almost three months working upon those paintings. By early December 2002, they were finished. 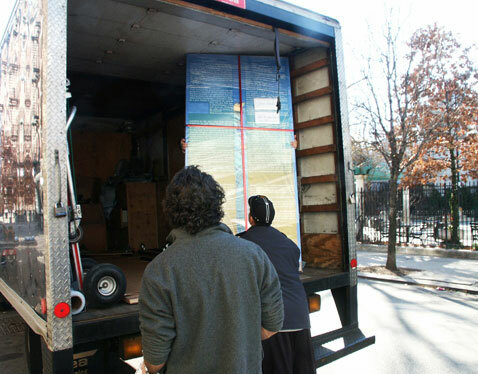 I came to New York on December 16th, bringing the canvases with me, had them stretched at Baobab Art Framing (a company located at the time on East 12th Street, nowadays in Brooklyn). My contact there, a man named Barry, had them delivered as a gift to James Hanlon, at his Duane Street Fire Unit's address -Hanlon was one of the Fire men who had escaped the crumbling of the towers. Why James Hanlon Why? It turned out that I had seen on the French TV network France 3 a film by the Brothers Naudet and James Hanlon, who told the heroic story of the forefront men from Engine 7 Ladder 1, based at 100 Duane Street, just next door to the Twins. 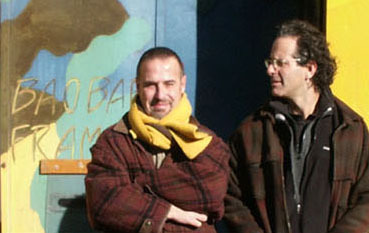 After the events of September 11, Hanlon continued to work there as a firefighter (he was also a professional actor in TV series and in theatrical). Hanlon spoke at the end of that film, and his words were a huge -even the major- impulse in my following action. James Hanlon's words made me move on. He spoke out without hesitation for a reconstruction of the Twin Towers. I told James Hanlon (in a note joined to the paintings) that I offered him these works because of the statements he had made in his film, suggesting that we could work together at showing this concept and what it looked like to the New York citizens, since it was for them that I had created those works. After the paintings were delivered, I had the opportunity to speak on the phone with Gedeon Naudet (who was my contact with Hanlon) ; he confirmed to me that James Hanlon had received the paintings, entrusting me with Hanlon's very positive appreciation of these works. He told me that Hanlon would call me. Which was not due to happen. I called back many times at Gédéon Naudet's number, but only found an answering machine. I waited then for them to call, but nothing came. I returned to Paris without the canvases, and without any news from the men who had collected them. 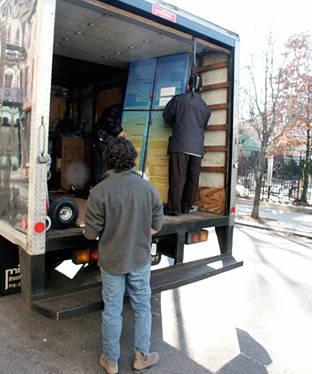 To this day and since 2002, I have no idea of what these paintings ever became, as no one among those involved at the time in the city ever gave any sign of life after my departure from the United States. Thus, it is safe to assume that this concept has never been seen by the New York Community through the medium that I had originally chosen, a triptych set of paintings. Never mind. What matters is that those paintings are in New York, because they were made for New York. Being a painter, and not an architect or an urbanist submitted to the official Program requirements, I have elaborated my concept as a whole, and in total freedom. Therefore I was not obliged to make a separation between the Rebuilding issue and the Memorial issue. Those two issues were in my view totally inseparable. They should have been led frontally, and not doing so was a mistake, in my opinion. This is why I conceived this monumental sculpture at the new Twin Towers' feet. 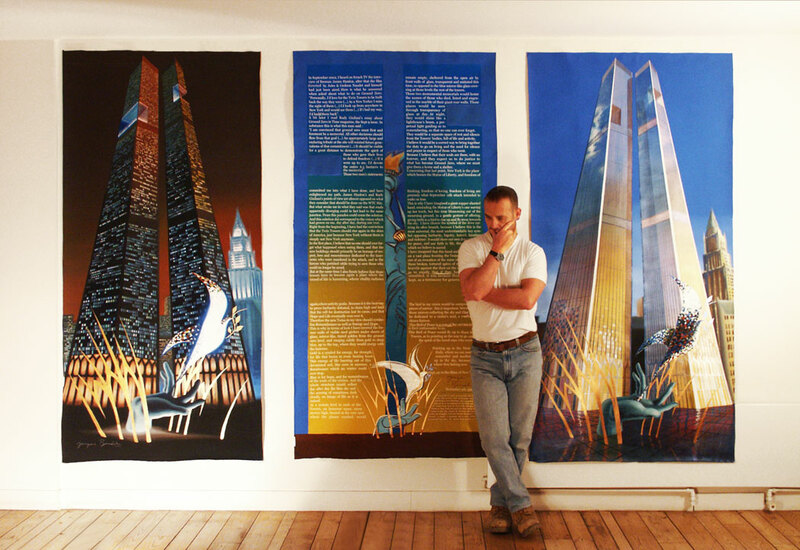 I felt the necessity to create a huge landmark on what had become Ground Zero If the Twin Towers had been rebuilt in something similar to the symbolic and aesthetic guidelines shown in my paintings, that implies that at their feet a vast esplanade would have been preserved, devoid of any structure, except for a sculpture of several tens of meter wingspan. Its role: to send a simple message, a message of compassion for the dead and those who were left behind, mourning and broken hearted ; but also a message of hope into the future. And finally a message as a symbol for peace. For expressing that, I carefully avoided to create an art form understandable only by three people on Earth specialised into Contemporean Art. My will, clearly, was to choose a symbol that everybody would and could understand. I am totally aware that this is not the smartest, hipest, cleverest and most sophisticated of symbols. At the time, when I proposed it in 2002, some considered this idea as being weak, and cliché. It probably continues to be so to them. On this topic, I have only one thing to say: let's just try to remember. Destruction came from the sky on September 11th. Thus, it seemed important to me that in their Renaissance, the Twin Towers could rise again and take flight, carried by the symbol of a Bird of Peace and Life, towards the very skies from which death pounced on Manhattan, on September 11th 2001. After the storm of death that came from the sky, from the sky would blossom a Renaissance. Today, we all know that this Renaissance will never happen, in the way I had imagined it could take form. Another one is sprouting out of the site of the late Towers. One unique tower. And a Memorial occupying the footprints of the missing buildings: a majestic, solemn and sober place which I feel is in total respect and harmony with the tragic events to which it owes its existence. New York, since a decade, has learnt how to heal its wounds, adapting to it new landscape. In September 2002, I heard on french TV the interview of fireman James Hanlon, after that the film directed by Jules & Gedeon Naudet and himself had just been aired. "Personally, I'd love for the Twin Towers to be built back the way they were (...) As a New Yorker I miss the sight of them (...) I'd look up from anywhere in New York and would see them (...) If i had my way, I'd build them back". A bit later I read Rudy Giuliani's essay about Ground Zero in Time magazine, the Sept 9 issue. 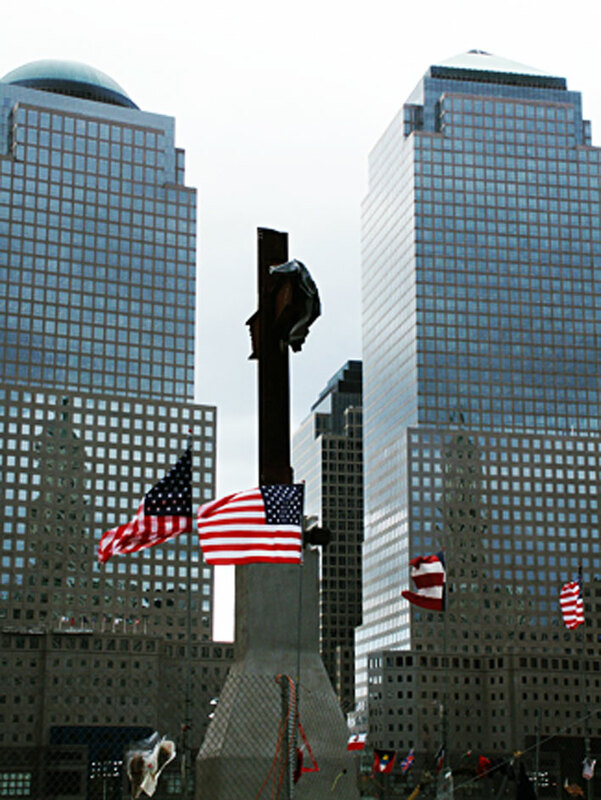 "I am convinced that ground zero must first and foremost be a memorial. All other decisions should flow from that goal (...) An appropriately large and enduring tribute at the site will remind future generations of that commitment (...) It should be visible for a great distance to demonstrate the spirit of those who gave their lives to defend freedom (...) If it were up to me, I'd devote the entire 6.5 hectares to the memorial"
Those two men's statements committed me into what I have done, and have enlightened my path. James Hanlon's and Rudy Giuliani's points of view are almost opposed on what they consider that should be done on the WTC Site. But what stroke me in what they said was that roads apparently diverging could in fact lead to the same junction. From this paradox could come the solution. And this solution did correspond to the vision which had grown on me, day after day, during one year. 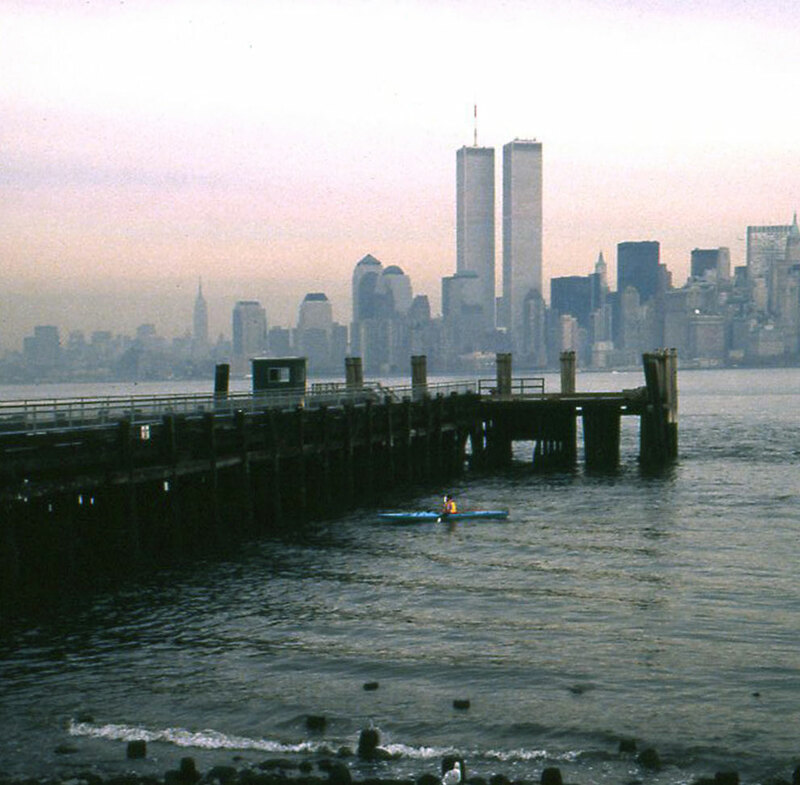 Right from the beginning, I have had the conviction that the Twin Towers should rise again in the skies of America, just because New York without them is simply not New York anymore. In the first place, I believe that no one should ever forget what happened when seeing them, and that the new buildings should primarily be an homage of respect, love and remembrance dedicated to the innocents who were murdered in the attack, and to the heroes who perished while trying to save those who could no longer be saved. But at the same time I also firmly believe that those towers have to become again a place where the sound of life is humming, where vitality radiates again, where activity peaks. Because it is the best way to prove barbarity defeated, to claim high and loud that the will for destruction lost its cause, and that hope and life eventually won over it. Therefore the new Twins in my view should symbolize remembrance as well as energy and hope. This is why in terms of look I have covered the former walls of visible steel girders under sheets of glass, mirror-like, tinted golden from the ground zero level, and ranging subtly from gold to deep blue, up to the top, where they would merge with the heavens. - Gold is a symbol for energy, for strength, for life that burns in every beating heart. This energy of life bursting out of this devastated soil, like corn in summer, a Renaissance which no winter could ever stop. - Blue is for hope, and for remembrance of the souls of the victims. And the whole structure would reflect day after day the blue sky and the passing of sometimes dark clouds, an image of life as it is, indeed. At a certain level in each of the Towers, an immense space, many storeys high, located at the very spot where the planes crashed, would remain empty, sheltered from the open air by front walls of glass, transparent and untinted this time, as opposed to the blue mirror-like glass covering at those levels the rest of the towers. Those two monumental memorials would home the names of those who died, listed and engraved in the marble of their giant rear walls. Those places would be seen through transparency of glass at day. At night, they would shine like a lighthouse's beam, a perpetual light guiding us to remembering, so that no one can ever forget. 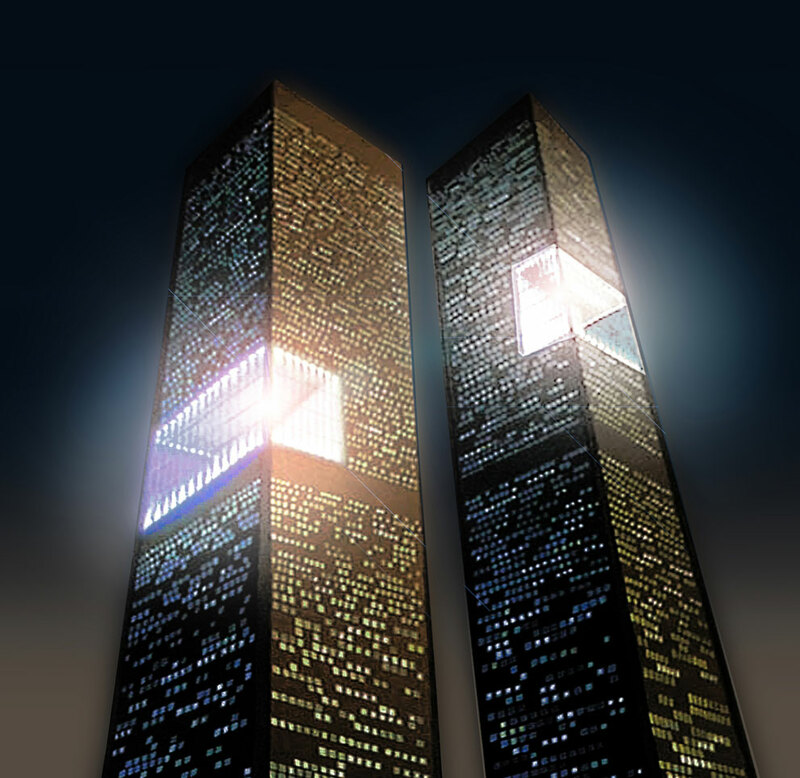 They would be a separate space of rest and silence from the Towers' bodies, full of life and activity. I believe it would be a correct way to bring together the duty to go on living and the need for silence and prayer in respect of those who went. Because I believe that their souls are there, with us forever, and they expect us to do justice to what has become Ground Zero, where we must give them a home and a shelter. Concerning that last point, New York is the place which homes the Statue of Liberty, and freedom of thinking, freedom of loving, freedom of living are precisely what September 11th attack intended to make us lose. 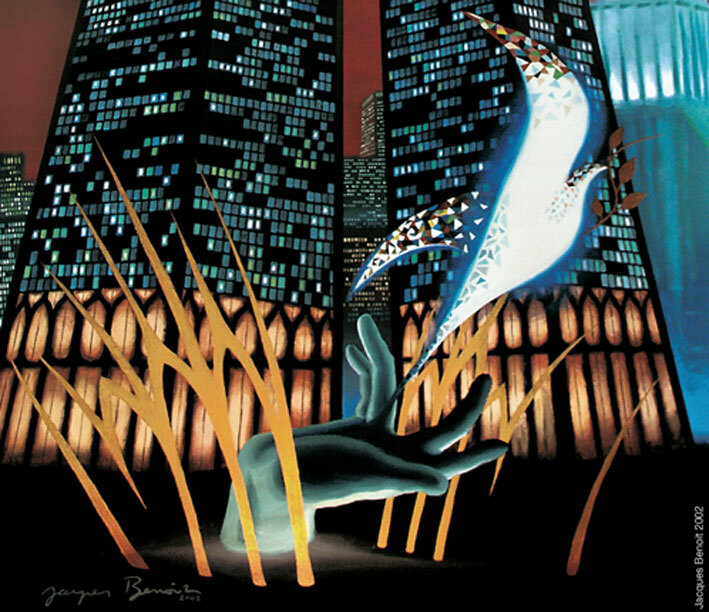 This is why I have imagined a giant copper-sheeted hand, reminding the Statue of Liberty's one waving up her torch, but this time blossoming out of the mourning ground, in a gentle gesture of offering, giving birth to a bird to rise up and fly away towards the sky. I have chosen the symbol of the dove carrying its olive branch, because I believe this is the most universal, the most understandable key symbol opposing barbarity, bigotry, hatred, fanatism and violence: it would show our own determination for peace, and our faith in life, this precious life which we believe is sacred. I have imagined that this hand and this bird, alone on a vast plaza fronting the Twins, would emerge out of an evocation of the ruins of the late towers, those broken, tortured spires of steel which stood bravely against the dust on the devastated site, as to signify that if they had not entirely crumbled, it was because they wanted to be kept, as a testimony for generations to come. The bird in my vision would be composed of 2801 pieces of mirror: this is important, because each of those mirrors reflecting the sky and the sun would be dedicated to a victim's soul, a reflection that shines forever. This Bird of Peace is a sum of the victims' souls, he is their ambassador to us. This Bird of Peace would seem to fly up to the top of the Towers, as to pointing us the way to go and meet the spirit of the loved ones who went away. Pointing up to the Monumental Halls, where we can meet them, remember and meditate, high up in the sky, because this is where they belong now. High up in the Skies of New York.